Do you know who was the first American woman allowed to vote for her husband for president? It was none other than Florence Kling Harding, wife of Warren G. Harding, born on August 15, 1860, in Marion, Ohio. She was a strong supporter of women's suffrage (the right to vote) and was able to cast her ballot for her husband in the presidential campaign of 1920 because the 19th amendment had been ratified that summer. 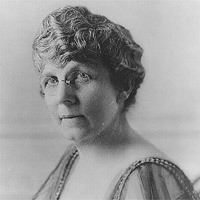 Florence Kling Harding was a wife, mother, and business manager and was one of the first women to bring a professional identity to the role of first lady.